As a tourist attraction, Mount Qincheng really does have something for everyone. It is located approximately 41 miles (66km) from Chengdu. The mountain is one of the most famous Taoist mountains in China, and is a popular destination for international travellers and locals alike. It is usefully divided into two sides, which provide very different experiences. The front side of Mount Qincheng (anterior) is the more touristy side, and boasts an impressive array of cultural and historical landmarks. A number of temples to be visited include the Jianfu Palace, Shangqing Palace, and the Tianshi Cave. However, for those who prefer to travel off the beaten track, the back side (or posterior) is relatively quiet and unspoiled, offering a stunning hiking route along narrow mountain passes, past waterfalls and through wooded areas. This trip is a must for those interested in the flora and fauna of the area. Whether travellers are keen on the more frequented front route, or the adventurous trail at the back, the views from the summit are spectacular. Although the paths are very well-maintained, the hike is pretty demanding on both sides; nevertheless, there is a cable car which can be taken half-way or all the way up. 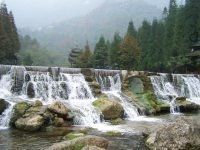 The mountain is the ideal travellers escape from crowded urban sightseeing and makes for a delightful excursion from Chengdu.